60s. Apart from two England Under 23 caps, he spent all of his career playing in variations of blue and white – all four of his club sides played in those colours. He managed just over a hundred goals from the wing in his career with almost half of them coming for Huddersfield during a six year stay which straddled the sixties and seventies. Apart from a few games on loan on the south coast, he stayed in his native Yorkshire until he moved down west to take on a player coach role – who is he? 70s. 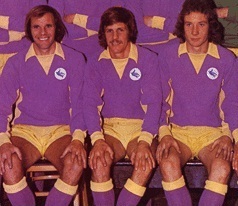 Doubly masculine Huddersfield stalwart from this decade (3,7). 80s. The first two clubs the defender pictured below played for are bitter rivals from the same city, the third was an eastern city known for it’s hot stuff and then he returned home to play for bubbly dreamers. It was while he was at this club, that he was loaned out to Huddersfield where he played twelve times with one of his appearances featuring in the club record books for all of the wrong reasons. His playing days ended at a club from the home counties which was on a journey into the Football League, where they remain to this day, and it saw the beginning of a successful partnership with his manager there which extended into coaching with the league title wins and international recognition which eluded him as a player, but can you name him? 90s. Name this member of a City side to face Huddersfield during this decade. 00s. He played twice for City against Huddersfield during this decade and we were the first of what I make it to be ten different Welsh clubs he played for, who am I describing? 10s. The last goal scored in a City v Huddersfield match at Cardiff City Stadium is, I believe, a candidate for one of the best ever seen at our new ground, who scored it? 60s. Former Sheffield Wednesday, Huddersfield, Brighton and Bristol Rovers forward Colin Dobson. 80s. Former Spurs, Arsenal, Norwich and West Ham player Steve Walford who was is in the Huddersfield team which crashed to a club record defeat when they lost 10-1 at Man City in 1987. Walford subsequently played for Wycombe and has become a member of the coaching staff which has tended to follow Martin O’Neill from club to club, culminating in their work together for the Republic of Ireland. 00s. Layton Maxwell came on as a sub for us in two matches against Huddersfield in 2002, he went on to be play for Barry Town, Swansea City, Carmarthen Town, Newport County (trial), Rhyl, , Bangor, Caernarfon, Port Talbot (trial) and Aberaman.